Manic and information overload best describes our first week in Latvia. Trying to find our own home, opening banks accounts and finalising our UK tax and pension affairs are just some of the many tasks we have faced. Also coming to terms with the fact that we are not on holiday and that this is a permanent move is taking time to mentally adjust to. Role reversal is also taking place in my relationship with Inta. Whereas in the UK I took responsibility for sorting out most things, here due to my total inability to have any sort of conversation in Latvian, responsibility has fallen on Inta to translate everything. Shopping and every day stuff is fine, but trying to translate the technical specifications of a VW Golf or the legalities of buying a house are causing headaches and it comes as a welcome relief when the car salesman speaks English. I’m sure this is just a short term hiccup and normal service will resume in the future. However the concept of woman on top might prove to be an experience that I wish to continue with. Time will tell. One thing I have done, is to thrown myself in to the Latvian connection with nature. Mint and camomile tea with organic honey is a delight. Have even been sleeping on buckwheat pillows. The pillow is filled with dried buckwheat grains which are about the weight of a grain of rice but rounder and are meant to have many health benefits. Inta is convinced she is getting a better nights sleep because I no longer snore. For those of you who are interested click here for more information. Next thing to try is the traditional black sauna. The name black sauna derives from the fact that the hot coals/stones in the sauna are heated by burning wood underneath them. Over years the smoke from the burning wood causes the walls of the sauna to become black. Hence the term “Black Sauna”. There is one tradition that I’m not sure about though, as it has appears to have links with some type of sado-masochistic ritual. Whilst in the sauna you or somebody else is supposed to flagellate you with branches of a tree, with leaves attached, silver birch being the preferred weapon of torture. Oh what the hell, when in Rome do as the Romans do. The Latvians like their food fresh. 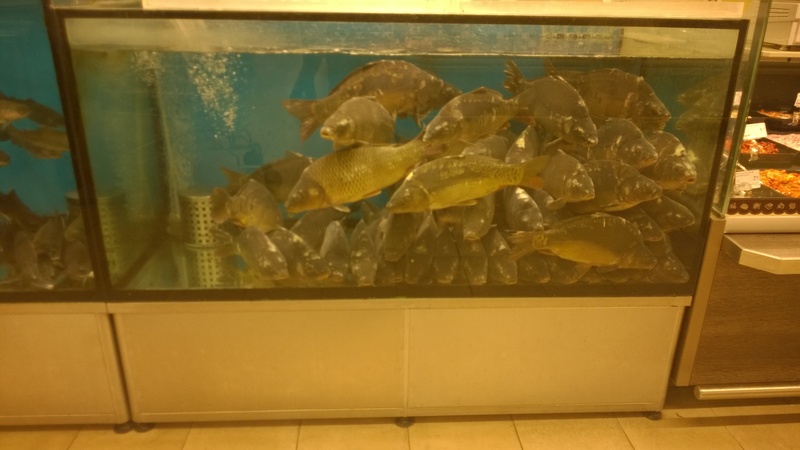 In many a supermarket you can choose your own fish out of a tank of fish happily swimming about in less than spacious accommodation. s a great idea and something our UK supermarkets should adopt. However today we went to the central market in Riga where you can just about buy anything. The Market is situated in 4 perhaps 4 old German Zeppelin hangers remaining from World War II. One hanger is occupied by fish sellers and to help the customers make a more informed choice they put live fish on display out of water. RSPCA would have a field day here. Walking by as the carp and sturgeon looked at you gasping for breath made me feel slightly uncomfortable. Live fish aside, this is a fantastic experience for a foodie. 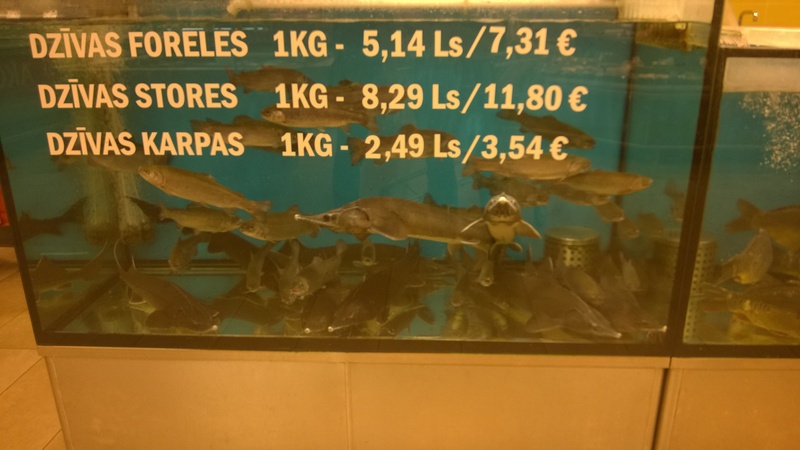 One problem though, Inta can’t translate the Latvian names of the fish so buying can become something of a lottery. We did manage to buy some halibut steaks though at 8.60 euros/kilo much cheaper than the UK. House hunting has been fun and I hope we may have found something if we can do a deal with the vendors. After deciding to leave the UK we started searching the internet to see what was available. 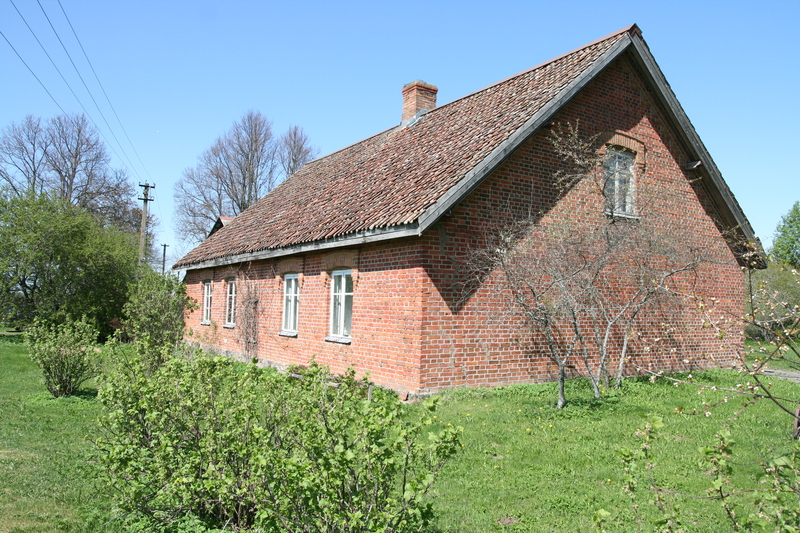 We wanted something with some land, with enough accommodation for our families and friends when they visit and no more than an hour from Riga. Well we found something that seemed perfect and we kept watching with trepidation in case it sold. Well it didn’t and we viewed it yesterday. It was an anxious drive to Limbazi, both of us worried in case it failed to meet our expectations. It was perfect, in fact much nicer than we could have anticipated. So how much, I can here you asking? Well for 2 houses, one which needs a total renovation, sat in 3.2 hectares of land, the asking price is £77,731. 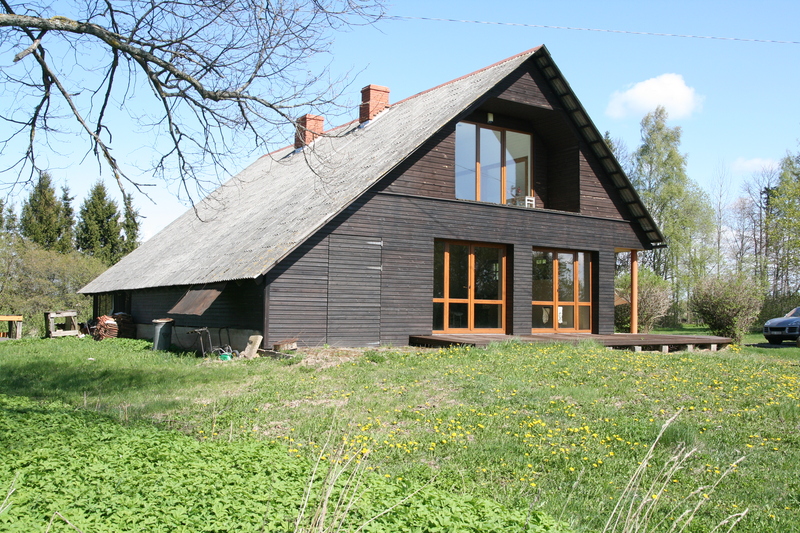 Yes, property prices are much cheaper in Latvia!!!! Hopefully I will be able to inform you in my next blog that we have a house. Keep tuned in. Went car hunting today and found out that there is no market in Latvia for a used right hand drive Vauxhall Vectra 1.9 CDTi with only 58000 miles on the clock. Should be surprised really. Problem that officially I’m only allowed to drive this in Latvia for up to 3 months. Not sure what I’m meant to do then but it looks like I’ll have to return to the UK to sell it. Chance to see everyone again. Well I think that’s enough for today. Look forward to reading your comments. 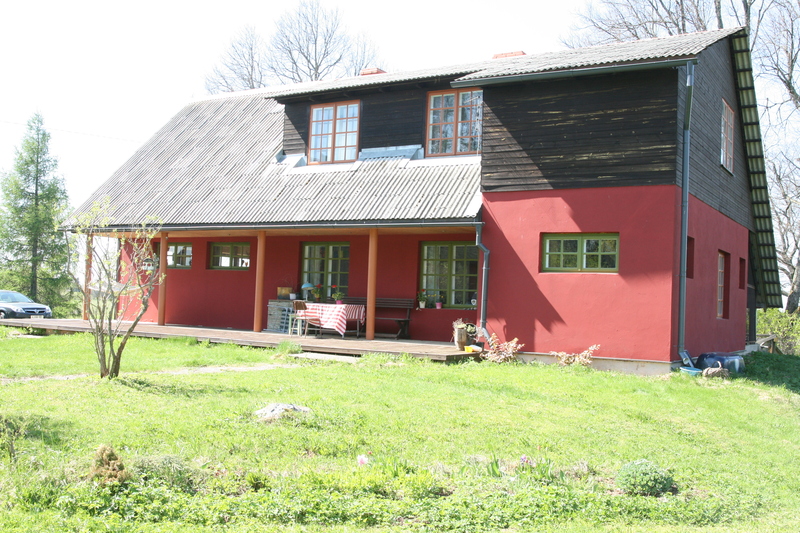 This entry was posted in Latvia and tagged edieni, food, ipasumi, Latvia, Latvija, Limbazi, property, Riga. Bookmark the permalink. Surely you don’t have to take another driving test? Is it just the car which isn’t legal? No, just have to come back to the UK to sell it. I will probably have to swap my UK driving licence for a European driving licence as you can’t put a non-UK address on a UK driving licence. Andrew, it’s nice to see you updating the blog nowadays. Pop back into school some time, mate. You can use your UK driving licence in Latvia. Upon it’s expiry you will be required to change it to a Latvian driving licence. You can use your right-hand drive car if you are only visiting Latvia. If you plan to reside in Latvia you will need to register your car and re-arrange it for left-hand driving. You will be given 6 months from the date of registration for this. Please see the website of the Latvian Road Traffic Safety Directorate for more details and any additional information about driving in Latvia. Don’t know if it would be worth it price wise but may worth considering to make it saleable if you just don’t want it any more.